You are here: Home / Foot Care Blog / Shoe Odor / Survey Says: Sweaty Armpits Ok; Smelly Feet & Breath Are Not! October 9, 2013 /0 Comments/in Shoe Odor /by Jenn F.
Whether we realize it consciously or not, our sense of smell has a way of guiding our instincts. For instance, a 1995 study found that women were most attracted to sweaty t-shirts of men whose immune systems were most unlike their own. The biological implication of choosing a mate with a diverse genetic profile is fairly obvious. The more different genes our children carry, the more immune they are to pathogens. Other studies show that armpit sweat can actually attract a mate. 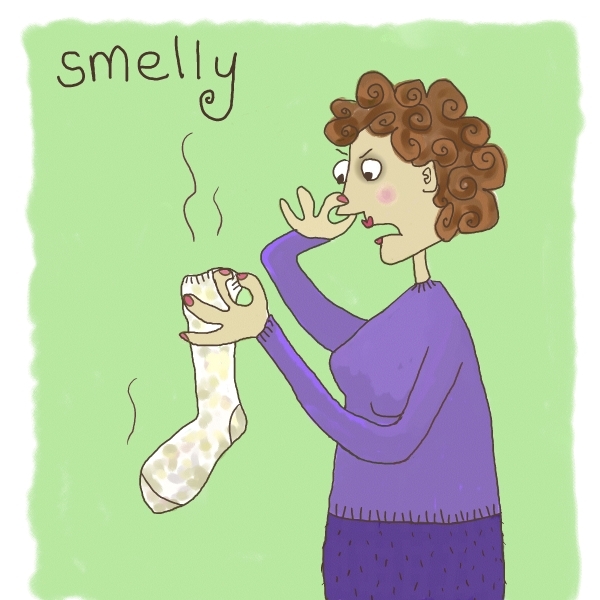 However, the same tolerance is not true of bad breath or smelly feet! What Do Studies Say About Smelly Feet & Sweaty Bodies? According to UK magazine Female First, a German study found that having a good sense of smell was predictive of a long-lasing relationship. Men with no sense of smell tended to have two partners over a lifetime, whereas men with normal sense of smell tended to average ten partners. Women who couldn’t smell were more insecure, but averaged four partners. – 87% of women would not go on a second date with a guy who smelled bad on the first date. – 67% of women said they would walk away from a guy who had smelly feet. – 57% of women said they would promptly stop dating someone with bad breath. Not All Odors Are Created Equal! Yet, ironically, 64% of women said they found the smell of “fresh sweat” appealing! We’re not suggesting you hit the gym and scarf down a pumpkin pie immediately before your next date, but you should definitely take whatever steps you can to keep the more unsavory human odors at bay. Halitosis (bad breath) can be cured by brushing / flossing / mouth-washing several times a day, cleaning your tongue with a toothbrush, drinking water, and getting your overall health checked out to be sure there isn’t an underlying medical problem. Smelly feet can be treated by wearing more breathable shoes and socks, putting scented insoles into your shoes, changing your socks twice a day, powdering your feet, and using the SteriShoe UV shoe sanitizer to zap away bacteria, fungus, and other smelly pathogens building up on your footwear. If this topic applies to you, be sure to check out our article about “5 Cures For Stinky Feet That’ll Save Your Relationship!” Don’t let smelly feet stop you before you get started in the dating world!